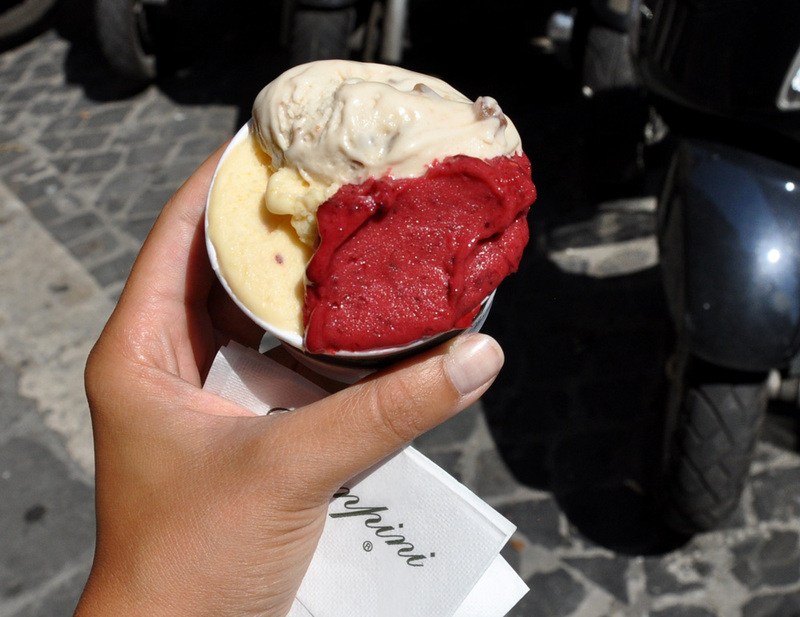 In search of the best gelato in Rome? You’ve come to the right place. 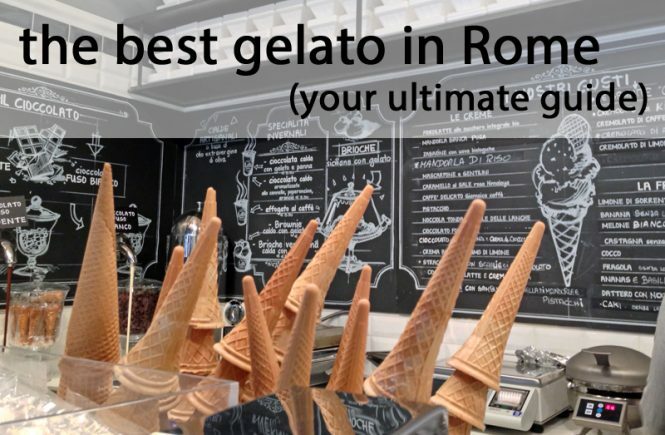 Here’s my list of eight go-to stops for the best gelato in Rome. Note: This post was last updated in May 2017. Gelato isn’t just the Italian word for ice cream. It’s different than ice cream. And that means when eating gelato… you can expect a different flavor, and texture, than you would from ice cream back home. First big difference: There’s less butterfat (4 to 8 percent, compared to 14 percent for ice cream). Result: Gelato freezes less solidly and is more melt-in-your-mouth. Secondly, ice cream makers often increase the weight of their product with water, and its volume with air (an easy way to sell more, from less!). But according to E.U. regulations, that process, called “overrun,” isn’t allowed — meaning gelato is higher-density, and the flavor higher-impact. That also means that if ingredients are high-quality, you can really tell. Because you can really taste them. (Wild, I know!). Finally, ice cream is made for long-term storage. Gelato isn’t. It’s frozen quickly, in small batches, so has to be eaten fresh. That li’l gelato primer might give you more of an idea of why I’m about to say the following. 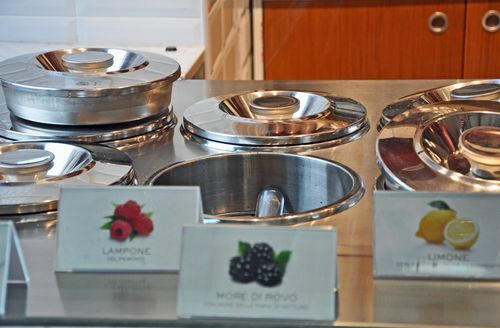 Stainless-steel trays of gelato don’t always mean that gelato is “artisanal”… but it’s a much better sign than puffy, colorful mounds! And two: If the colors are too bright, the gelato ain’t right. Those high-octane colors mean lots of chemicals were used in the process. (Ever tossed an apple in a blender, or a banana? Then you know they don’t come out bright green and bright yellow). So steer clear. Just want to know where the best places are? Without further ado, here they are! (And here’s a handy map to make your gelato-stalking even more successful!). 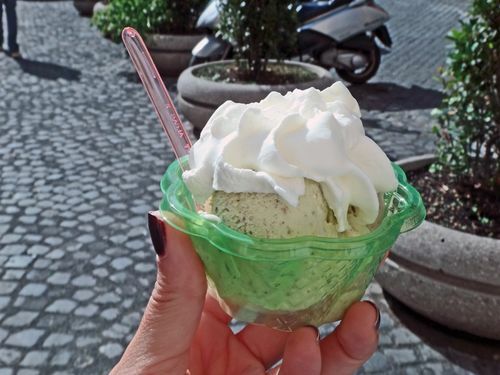 When it comes to gelato, Ciampini, an elegant little cafe on Piazza San Lorenzo in Lucina, isn’t trendy. The gelato isn’t organic. The flavors aren’t crazy. The foodies don’t (always) flock there. So why do I find myself coming back for a scoop, week after week year after year? Because it’s just. So. Good. The mostly-classic flavors, like pistacchio and coffee, are done as they should be: all high-impact flavor and creamy texture. (No graininess or iciness here!). But what really keeps me coming back is the marron glacés (see up top), where bits of chewy, candied chestnut are mixed in. Pair it with the cioccolato fondente (dark chocolate), and it’s a match made in rich-gelato-flavor heaven. Ciampini is located at Piazza San Lorenzo in Lucina 29, in between the Spanish Steps and the Pantheon. After a visit to the Vatican or Castel Sant’Angelo, reward yourself with this homemade gelato made from all-organic, fresh ingredients. Ignore the stark atmosphere and focus on the gelato instead: I especially love the chocolate-and-rum (made from chocolate fondant, not cocoa powder) and pistachio (made with fresh-roasted Sicilian pistachios) flavors. Dei Gracchi is located at Via dei Gracchi 272, about a 10- to 15-minute walk from St. Peter’s Basilica or Castel Sant’Angelo. (Il Gelato, and Fatamorgana, below, are two other Vatican options). Gelato from Il Gelato, near Piazza del Popolo. This flavor was probably, like, celery or something. Il Gelato, and its gelato master/owner Claudio Torcé, already had attracted foodie fame for the shop’s all-natural ingredients and wild flavors. There’s something here for everyone, from classic flavors (hazelnut, chocolate) to crazy ones (chocolate and chili pepper, gorgonzola). The ingredients are very high-quality, so no matter what you go with, my money’s on the fact that there won’t be any surprises: gorgonzola does taste like gorgonzola. Il Gelato di Claudio Torcé’s most central locations are at Viale Aventino 59, near Circus Maximus, and also at Piazza del Risorgimento 51, near the Vatican. Finally, Monti has a top-notch, artisanal gelateria! That’s thanks to Fatamorgana, which opened a new location here about a year ago. With fresh ingredients, and without colorings, gluten, or chemicals, Fatamorgana’s gelato is the real deal. It’s also delicious. (There’s another convenient location for visitors not far from the Vatican). Fatamorgana has several locations; its most convenient are at Piazza degli Zingari 5, a 10-minute walk from the Roman forum, and Via Leone IV 50, near the Vatican. Update: Carapina closed in 2017. Such a bummer! Check out Vice for another central option instead. Carapina opened in May 2015 around the corner from Campo dei Fiori, and it quickly won my heart (and stomach). Fresh, with the batches made in the store, and without preservatives, synthetic chemicals or thickeners, it’s delicious gelato that bursts with flavor. On a recent visit, I found myself blurting out, just like a kid from a Willy Wonka factory tour, “The persimmon tastes just like persimmon! The chestnut tastes like chestnut!” Which is, of course, how it should be — but often isn’t. (Here’s more about why I love Carapina). 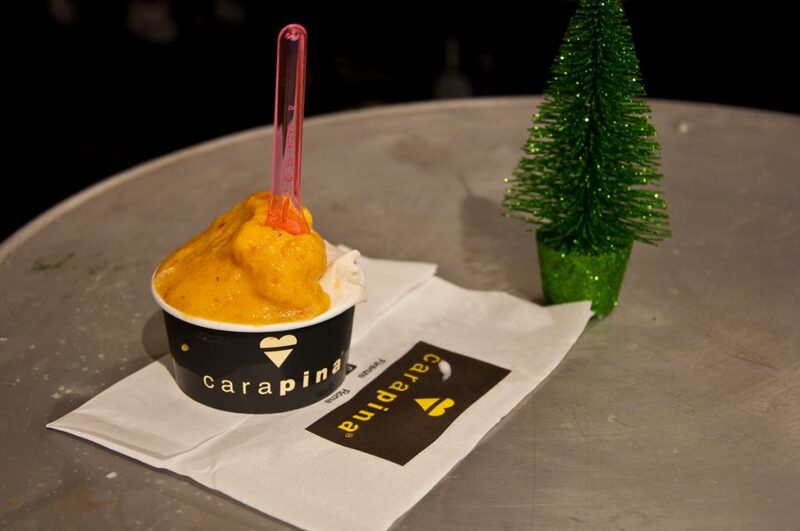 Carapina is located at Via dei Chiavari 37, next to the Roscioli bakery. Vice is another all-natural gelateria that’s quickly taking over Rome. 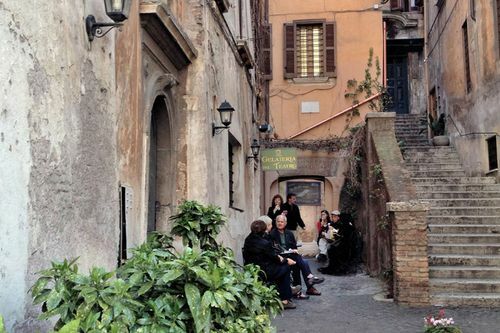 Its most convenient (and popular) location, by far, is right near the Largo Argentina bus stop (not far from the Pantheon) — it’s nearly always packed. Fight the crowds, though, and you’ll be rewarded. Their gelato is the real deal. Vice has several locations, but the most convenient are Corso Vittorio Emanuele 96 (near Largo Argentina) and Via Gregorio VII 385 (near the Vatican). Another relatively new addition to the Rome gelato scene, Come il Latte opened a couple of years ago around the corner from I Caruso (below) — which means, what better excuse to do a compare-and-contrast taste test?! Recommended to me by none other than gelato master Claudio Torcé, it serves up delicious, super-creamy gelato (as you might expect from the name, “Like Milk”). Dairy not for you? No problem. Eight flavors come sans any milk whatsoever — all are just as flavorful. (Here’s more on my love affair with Come il Latte). Come il Latte is located at Via Silvio Spaventa 24/26, a 5-minute walk from Piazza Repubblica (and just around the corner from I Caruso). I’ve sung the praises of I Caruso before. 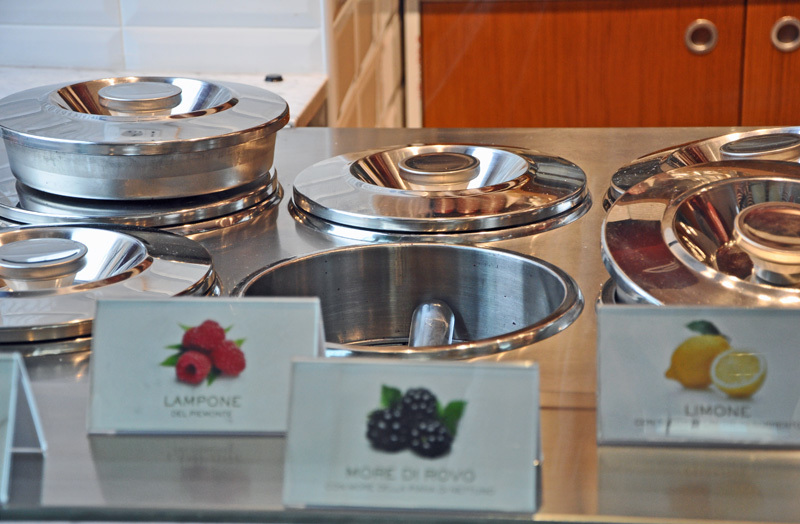 In brief, here’s what I like: They make their gelato on site (you can even watch them do it!) from all-fresh ingredients. 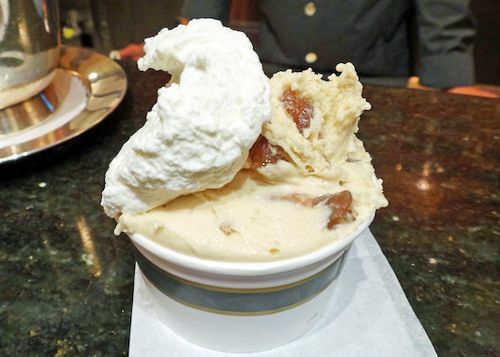 The panna, whipped fresh right there, is delicious (go for the zabaglione flavor). Their fondente, a super-creamy dark chocolate is particularly good, as are the fruit gelatos, which burst with flavor. (If it’s in season, try the mandarin orange). The secret’s out on this hole-in-the-wall gelateria, though, so if you’re here in the height of summer, be prepared to wait. I Caruso is located at Via Collina 13/15, about a 10-minute walk from the Termini or Repubblica train stations. Hey, those all sound great! But aren’t you missing a couple of spots? Not really. These are my personal favorites, so not everyone will agree with me. 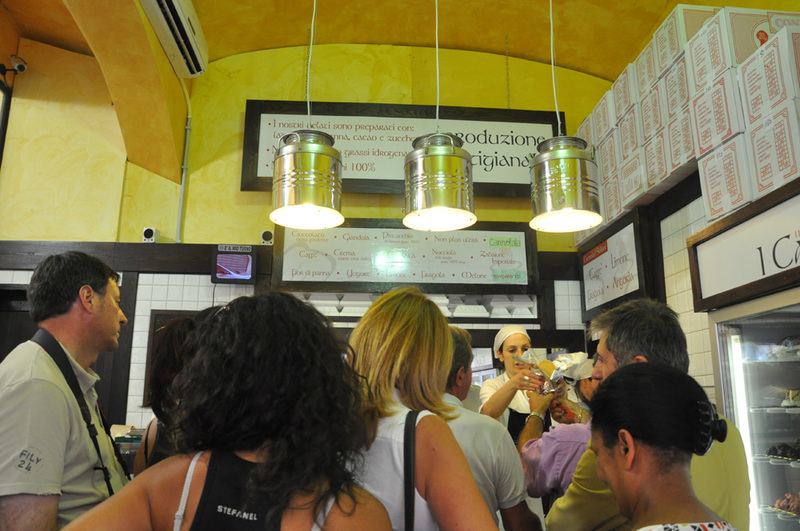 But some of Rome’s most beloved gelato shops just don’t do it for me. Giolitti? Sure, the atmosphere is fun, the location is right near to the Pantheon, and even many Romans confused by their nostalgia count it as one of Rome’s best shops. But I often find their gelato icy (the sign it’s not very fresh). In general, it strikes me as one of those Rome places banking more on its past than on turning out high-quality food right now. Then there’s San Crispino, which is equally meh. I feel the same way about it that I do about Eat, Pray, Love, and that’s not a good thing. (Also, I find the gelato grainy and low on flavor). Grom is okay, but strikes me as little soulless. One previous favorite that I’ve taken off my list, meanwhile, is Gelateria del Teatro. Although it wins serious points for location (see below), it no longer does, in my book, for its gelato. The size of the shop expanded a couple of years back along with its reputation, and today it’s not only always completely packed with tourists, but the gelato itself has just lost some of its flavor. And don’t even get me started on Blue Ice. Forget about the best gelato in Rome. That’s not even gelato. Also: where to go swimming in Rome, the city’s best trattorias and what kind of weather you should expect in every season. If you liked this post, then you’ll love The Revealed Rome Handbook: Updated, Expanded and New for 2017, which includes many more tips and tricks like these in more than 200 information-packed — but never overwhelming! — pages. It’s available for purchase on Amazon or through my site here! 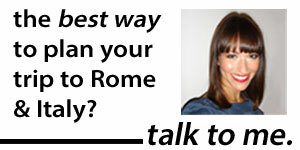 I’m also free for one-on-one consulting sessions to help plan your Italy trip.